One of the hardest things to detect in dentistry is the very earliest decay on the tops of children’s teeth. The grooves are often very steep and deep which can cause our instruments to stick and mimic active decay. At other times, the sides of the wall of the grooves stop our instrument from actually reaching the bottom of the groove so we have the outward appearance that all is well. 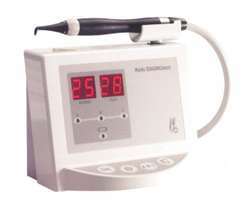 With our laser detection, light is bounced into the deepest parts of the grooves and can detect areas that are softer than normal tooth enamel. This soft area of decay, if caught soon enough can be removed and repaired without destroying so much of the tooth. Sometimes, it can even be done with out the use of anesthesia! The bottom line is the sooner decay is detected, the smaller the filling and the stronger the tooth remains. 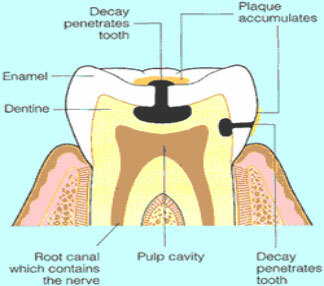 As you can see above in the picture, a cavity spreads through the enamel and stays fairly small, but once it hits the dentine below, it spreads out quickly leading to much more destruction and the need for a much larger filling. Early detection with the laser can allow you to catch a small filling and prevent it from becoming a large one. For cavities between teeth, we still have to rely upon x-rays since the laser must be able to hit the decay in order to detect it.